Advertise in your industry and expand the number of your business partners. 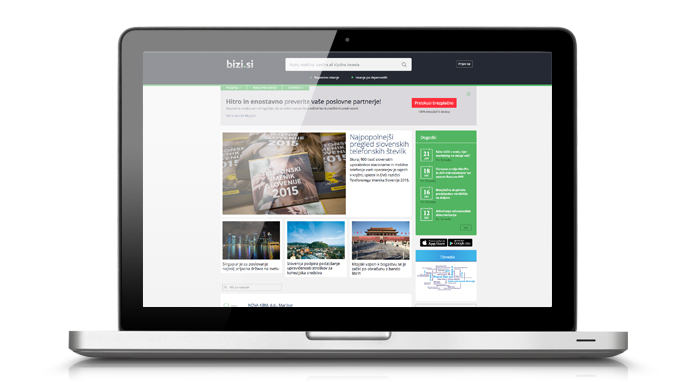 Bizi.si is the most visited Slovenian business website, reaching over 245,000 managers, finance experts, accountants, entrepreneurs, market researchers, salespeople and other users per month (according to MOSS). Achieve income growth through advertising to the right audience. BIZI.SI IS USED DAILY BY OVER 250,000 BUSINESSMEN FOR FINDING BUSINESS, CONTACT AND FINANCIAL INFORMATION. ADVERTISE AND PERSUADE THOSE WITH ABOVE AVERAGE INCOME. PERSUADE BUSINESSMEN WITH THE LATEST AND HIGHLY EFFECTIVE ADS. YOU CAN REACH YOUR OBJECTIVES WITH DISPLAY AND OTHER AD UNITS. ARE YOU INTERESTED IN ADVERTISING ON BIZI.SI?